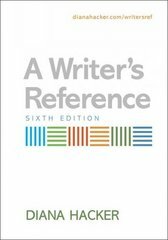 A Writer's Reference 6 Edition A Writer’s Reference is the most widely adopted college handbook ever published. The new edition is available in a classic version that provides more help with academic writing, serves a wider range of multilingual students, and lends more support for college research — all in an easy-to-use quick-reference format. Now for all the ways you teach your course, you can choose the classic version or choose from among 4 additional versions with varied content. A Writer’s Reference with Exercises is tailor-made for classroom use or for additional grammar practice with 86 integrated exercise sets. A Writer’s Reference with Writing in the Disciplines provides help for college writing beyond composition with advice and models in six academic disciplines. A Writer’s Reference with Writing about Literature includes an entire tabbed section on interpreting and writing about works of literature, with two annotated student essays. A Writer’s Reference with Extra Help for ESL Writers includes an entire tabbed section for nonnative speakers of English; it offers targeted advice and strategies for college writing and research.